Who is Erin Everly (Axl Rose Ex)? Erin Everly is a former American model, famously known as the first wife of the Guns N’Roses lead singer named Axl Rose. The couple had a long-term relationship which abruptly came to an end shortly after they tied the knot in 1990. The pair went their separate ways due to a series of irreconcilable differences. Despite trying so hard to make things work between them, all efforts were fruitless. Erin Invicta Everly was born in Los Angeles California on the 8th day of November 1965. She came from a lineage of stars, her mother Venetia Stevenson was a well-known actress; while her father Don Everly was a rock star notable for being a member of the rock band Everly Brothers. She isn’t the only child of her parents, Erin has an older brother named Edan and a sister named Stacey Everly. Her two siblings have equally established themselves in the American entertainment industry. Edan is a musical artist while Stacey pursued an acting career. When she was very young, Erin suffered from a reading disorder called dyslexia. This affected her a lot and posed a great challenge in her academics. She completed her basic education at Buckley College Prep School situated in Sherman Oaks, Los Angeles. Due to her parents’ financial issues, Erin and her siblings later transferred to a public school where they completed their education. There are no much details regarding her childhood and educational background. At the age of 16, Erin Everly relocated to New York City where she began her modeling career in 1981. When she arrived there, Erin signed up with Wilhelmina modeling agency. Throughout her time as a model, Erin signed endorsement deals with popular companies such as Guess, Jordache, and Bebe. She also appeared on several TV commercials and adverts, among others. While her modeling career was flourishing, Erin met Axl Rose in 1986 during a party in Los Angeles. Shortly after that, the duo became romantically involved with each other which led them to kick off their relationship in earnest. The couple eventually walked down the aisle in April 1990. Their wedding took place in Las Vegas and was attended by friends and family. 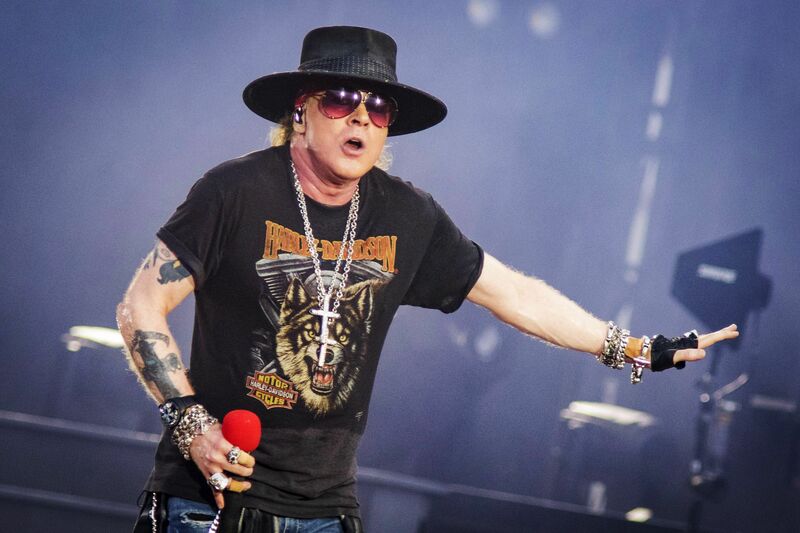 After a few months, they started having issues which led Axl to file for a divorce in January 1991. Their divorce was then finalized and the couple went their separate ways. Sadly, they didn’t have any kids from their marriage. Although Erin took in, she lost her pregnancy following the emotional and domestic abuse she experienced in the hands of Axl. After their divorce, Erin was also involved in a few other relationships before she finally got hitched to John C. Portman III. John is a well-known entrepreneur and the vice president of the Georgia-based property development company called Portman Holdings. Prior to their marriage in 1997, John was previously married and he had a daughter named Joannah Portman. Also, Erin has equally dated famous celebrities including Matthew Klyn, Donovan Leitch Jr., David Arquette, Anthony Kiedis, and Matthew Nelson, among others. After her marriage to Axl Rose ended in 1991, Erin Everly decided to live her life away from the limelight. Since then, she has been keeping a low profile without the interference of the media. She continued living with her husband John Portman as well as their three children – two daughters Esper and Erin Portman and a son named Eason Portman. However, her marriage to John also got dragged into the mud after ten years; thus leading to their divorce in 2006. As of now, there is no news of Erin’s current status and what she does.